The arch-organiser, Sarah, surpassed herself in booking us a cosy studio apartment within the walls of Dubrovnik. I was particularly impressed by this coup as we joined the crush at the spot-lit splendour of the main gate. Perhaps the overnight visitors were outnumbered by the surfeit of cruise passengers who paced the old city-state like troops of geriatric legionaries. During our first breakfast, tour parties of limping ancients observed me with glassy-eyes in the narrow confines of the city alleyways as I vainly dabbed the egg yolk from my mouth between bites, their shirt-tails close enough to mop up the leftovers. 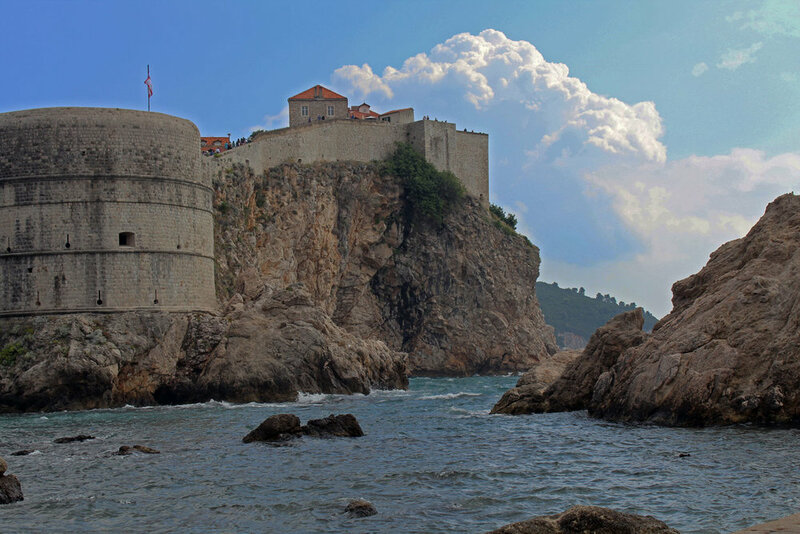 The mighty walls gave Dubrovnik protection from both real and fictional invaders – neither broached by the Turks or Yugoslavian army, nor the enemies of King’s Landing – depending on what happens in the next series of Game of Thrones. The night before we had sampled fine wines served by one of the nation’s three smiling people, before watching Anthony Joshua defend his heavyweight title on the steep steps of bar while sipping Rakia. It was meant to be an Irish bar, but wasn’t really. After circumventing the walls of the tightly packed city the next day, we delved into its medieval main streets and warrens of alleyways. For us, a photography museum was the pick of the tourist spots, while the Franciscan monastery and Rector’s Palace were worth the stroll. The photography museum soberly chronicled the War of Independence leading to the blood-letting that broke Yugoslavia up into half a dozen nations. Croatia got the beautiful coastline, but otherwise there was little to smile about. Another small museum had photos showing Dubrovnik under siege. The damage, which to some extent can still be seen around the city walls was not as powerful as the image of its splendid atmospheric streets being eerily deserted. Afterwards, we swam in the turquoise waters beneath the city walls where the ships had burned less than three decades earlier. Summer was making a brave last stand against the growing rains and storms of autumn. Our room was positioned high on the slope of the city facing down to the sea. Our landlord was a gentle affable 30-something who ran the business for his unseen ageing parents upstairs. It was a convenient location for eating at Madame Pi-Pi – a humorously named restaurant that needs no translation. It was his one recommendation, and not it transpired just because they were neighbours. Elsewhere, cartels of tourist restaurants charged the same prices for much the same food. The market for repeat custom was limited as most eaters will have set sail before their meals are digested. Madam Pi-Pi’s mascot was a stone statue squatting outside who gushed water from her lady fountain with lewd abandon. After queuing an hour for a table, we were seated underneath the vines and feasted on a large platter of barbecued meats. Towards the end, we earwigged the progress of a date between a young American woman and a male companion of vaguer international status. While the tone was friendly rather than intimate, it spiralled when he suggested that Donald Trump was a breath of fresh air to the world stage. Two hours of tightly bounded conversation were wasted in a moment of careless honesty. We tried to catch her eye to empathise, but she was already heading for the exit. The bus followed the coastal road for 150km. The villages of the mainland looked neglected but still largely inhabited. The nearby islands perhaps represented a more idyllic setting for tourists and those seeking greater separation from the state. This left hundreds of deserted coves for locals to appreciate the low-rent paradise on their doorstep. Here the incoming dollars missed the mark along with the national business of renting out apartments to foreigners. Briefly, we passed through a slither of seaside Bosnia and Herzegovina. The brutalist Soviet-era hotels that remained perhaps channelled a large proportion of natives seeking summer sun now that Croatia owned what they had once shared. Split resembled a Cote d’Azur town fallen out of fashion. The tourists flocked to the sturdy open museum of Diocletian’s Palace in a pleasant fusion of old and new. The Roman ruins represented another previous owner of a nation that took a long time to establish its independence on the Dalmatian coast. Sarah posed with two Roman legionaries – one of whom expected to go further as an IT consultant. We climbed a precipitous tower in which she gamely impersonated a gargoyle, while other good snapshots were neglected due to my acrophobia being brought on by the yawning open spaces between us and the hard cobblestones below. We hiked past the gin palaces of the harbour towards the cape for sunset from where we could look down on the mountain-framed city. The boats shrunk in size and luxury the further we went, but their vast numbers and a glance at a map clarified how living just off the coast was more natural than living inland out of its sight. At some stage, we agreed that it was unnatural for us to spend every minute together, and Sarah visited the market while I clambered onto some rocks several miles from the centre to sketch the boats. Secluded behind a wall, I was surprised by a middle-aged man with a snorkel and a bucket who set off past me to check his fishing nets or lobster pots. I looked at him for a full minute to catch his eye, but he was more interested in crustaceans, and waded off to do his thing. In the evening, we found an after-dinner bar that we recognised as our local in a parallel universe. Strangers were laughing and chatting each other up. It was packed and lively and our second smiling Croatian served us up a selection of Rakia for what she guessed suited our respective tastes. Such suggestions were usually made on gender lines. Several times, Sarah’s greater knowledge of wine led to her being elected as chief taster. The break from the traditional stereotype was greeted inscrutably. On our second night, I made a connection with a waiter after pointing out that Unchained Melody had just played for the seventh consecutive time. After changing the CD, he returned and stated bluntly: ‘I like you!’ without breaking his stony, matter-of-fact persona. He returned with two glasses and poured us a complimentary drink. Tipping is not expected in Croatia unless something extraordinary happens. We tipped both the smiling waitress and our waiter for the evening, but didn’t get to see their response.